Summary: Twins Ryan and Ashley are expert skiers, but they’re no match for an avalanche that thunders down on them when they’ve skied ahead of their parents. Both get buried, but Ashley manages to dig her way out. She sees one of Ryan’s ski poles sticking up, and frees him just in time. A blow to his head has caused temporary amnesia, and it’s up to Ashley to find them shelter for the night and get them to safety the next day. Ashley’s persistent determination (“grit”) is emphasized as she fights through a knee injury, a threat from a grizzly bear, and deadly cold to save herself and her brother. 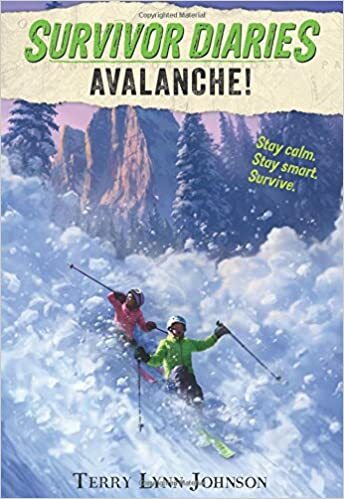 Includes tips for surviving an avalanche, websites with additional information, and an excerpt from Lost, the next book in the series due out in July. 112 pages (story is 86 pages); grades 2-5. Pros: Fans of the I Survived series will clamor for these action-packed stories of kids surviving natural disasters. Plenty of illustrations and non-stop adventure make these a great choice for reluctant readers. Cons: Each story starts with the survivor(s) telling their story to a nameless reporter, which seems a bit contrived.